Are you going to hide a key for them? No way. Today you have many electronic options that will allow you to issue temporary codes, unlock remotely, and even control the AC units etc, with peripheral components tied into a Z-wave or Zigbee system. They’re called smart locks, and we’ve reviewed them so you don’t have to. For improved security in your vacation rental or Airbnb, you want to find the best smart lock. The smart lock is a reliable and secure way to keep the house safe. Smart electronic deadbolts are easy to lock and unlock by your renter through the touchscreen or push buttons on the lock. Just enter the pin code, and they’re in the door. They will never have access to your home’s permanent key and once their code expires or is removed remotely from the lock, they can no longer access the home. You can connect these electronic deadbolts with your phones and control the locks remotely. The locks can be easy to install and program. If you don’t reside at the vacation unit or don’t want to take on the task, my company, ACME Locksmith, or your local locksmith company can help at affordable rates. Smart locks are swap out compatible with most existing deadbolts. In the worst case solution, a second small hole needs to be drilled to allow for lock pegs or wiring to pass through the door The pegs prevent twisting/torquing of the lock. When looking for the best electronic deadbolt for rental units or your Airbnb, there are a number of features and factors to consider. For example, durability, ease of use, ease of installation, and compatibility are a few. You need a product that is at least an ANSI Grade 2 lock. Grading helps determine the durability and safety of the lock. Grade 3 is the worst, Grade 1 is the best. For heavy use, you want a lock that has been constructed from solid, quality material and many Grade 3 lock products now have plastic parts. 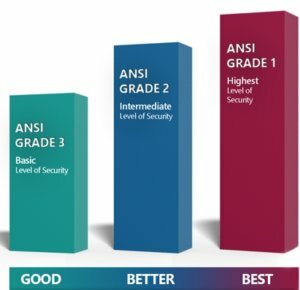 You may even want to consider ANSI Grade 1. Grade 1 smart locks have been tested to the most stringent standards. You can learn more about lock grading in our article Lock Grades Explained. For easy use of the smart electronic deadbolt, you need to consider one that is widely compatible. The device needs to integrate with a number of smart home devices like Alexa, smart lights, or your alarm system. This ensures the deadbolt can send quick notifications back to you. These components work together using either Z-wave or Zigbee technology. You will want a lock that supports one or the other. In addition to this, it also needs to support WiFi and optionally Bluetooth for seamless connection. These make it easy to control the lock remotely from your desktop remotely or a smart phone when you are at the lock. You also want a lock that is compatible with your current house key. Even though these locks are electronic, batteries will die and locks may malfunction. So when buying a deadbolt make sure that the key override for the lock matches the keyway of your house. If you’ve bought the lock online, take it to your local locksmith before installing so that he can key it to your house key. 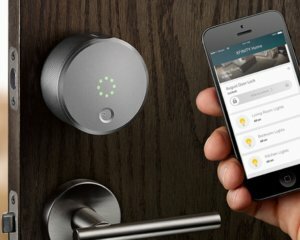 Some newer styles of smart locks are coming out without a key override. We recommend you stay away from those. These locks have terminal jumpers so you can hold a 9v battery against the door lock and give it a “jump start.” However, how often do you or your renter carry a 9v battery around? And should the smart lock fail, there is no substitute for the mechanical override. No additional holes to drill. This is a trade off. If you don’t need to drill, the installation is easier, but some of these locks will need a hole that a peg/rod at the top of the lock will go through. The peg makes it impossible to spin the smart electronic deadbolt around. Similar hole coverage. When switching to a smart lock, it is typical that the new electronic deadbolt will not cover the entire area left by the old deadbolt. This can result in exposed wood, stain, or scaring under the new lock (i.e.the new electronic door lock won’t cover everything that the old lock covered. Similar style of latch plate. If you are removing a lock that had a rounded latch plate and putting on one that has a square latch plate, additional chiseling may be required. Check out our article on How to Install a New Lock for lock installation instructions and tips. Push Button & Touchscreen Electronic Locks for Your Vacation Rental / Airbnb Smart Lock. In order to lock and unlock the device easily, you need to find a perfect lock with a touchscreen. The touchscreen should be wide enough and feature back-lit screen for easy operation at night and in bright daylight. Besides this, it should also be fingerprint resistant to protect against smudges and fingerprints; this helps protect against pin code theft from the fingerprint pattern. Some touchscreen will even show random numbers that you touch prior to entering your pin code to further protect against this type of pin code theft. 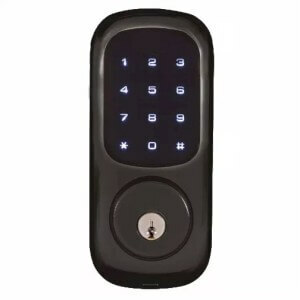 Additionally, you may want to consider other things like the number of pin codes the lock accommodates, how easy is it to program from your smart phone (and while at the lock) and the cost of the lock. Below are our Locksmith recommended, best locks for your vacation rentals/Airbnb home. The Yale YRD226-ZW (Z-wave) is a Grade 2 lock that is meant to last. It has a touchscreen and comes with the Z-wave already installed. The lock has a large and ergonomic touchscreen, which makes it easy to use. The backlight and captive touch is highly durable as the numbers will never wear off. This is the lock I have on my home and I just haven’t found one I like any better. They are rugged, they don’t fail often, and I love the look. We just never have any issues with them. But they do lack some important features for the vacation rental / Airbnb rental market. The primary missing rental lock feature is that you cannot add and change user codes from the app. As the homeowner, you have bluetooth to allow you to quickly make these changes from your cell phone, but for your tenants there is no way for you to do this offsite. You can, however, issue digital keys to provide your renters. This feature will meet the requirement of giving renters access from your location.These keys can be set to expire at a given time when the rental contract is up. But Yale charges $2 to create one of these keys so there will be an ongoing cost if you use this smart lock solution for your rental. Additionally, this electronic deadbolt can be set to send pre-programmed alerts directly to your phone and view access history. The Yale226-Zw smart lock is able to integrate into over 50 home automation systems for remote control using Z-wave. For example, it integrates with alarm systems, SmartThings and Honeywell. It supports up to 25 user codes, but that number goes up to 250 when it’s connected to a Z-wave network. It can be set to auto lock, and has a tapered bolt to better align to the strike on rental doors that have aged over the years. And one of my favorite features, it can be purchased in a Kwikset or Schlage keyway. These are the two most common keyways in use for vacation homes and Airbnb rentals. This ensures that the override key can be made to work off of your existing rental home’s key. Other lock manufactures lock you into using their brands, but Yale can do either. The durability of the smart lock is a key consideration to look out for when making the purchase. This is a highly durable lock built from quality material. The sleek metal design plus tamper-resistant cover makes it highly durable. Secondly, the installation process of the lock is easy and quick on any door. 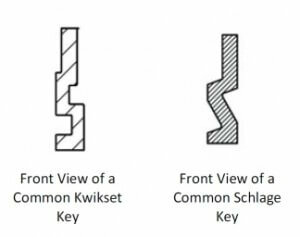 The Kwikset SmartCode uses Kwiksets patented SmartKey technology that is, essentially, pick proof and bump proof, to provide an increased security level for your vacation rental or Airbnb rental unit. Kwikset SmartCode is easy to lock and unlock thanks to the large touchscreen. The back-lit-keypad is easy to use due to increased visibility. Besides this, the lock can be controlled remotely thanks to the Z-Home automation system, but this does require a 3rd party smart home controller purchased separately. This makes it easy to lock and unlock the door from any given place. In addition to this, this rental home lock can be set to re-lock itself after 30 seconds ensuring that your house stays secure. You never worry about the door being unlocked. The Kwikset Smart Lock utilizes SecureScreen technology. This patented security feature makes it hard for one to identify the codes by checking out the fingerprints on the screen. When the lock is activated, and awaiting a code, it first lights up two random numbers that the user must press before entering their code. This is meant to eliminate someone from determining a code by looking at the oily residue left behind on the smart locks touch screen. August Smart Lock Pro is one of the best locks for vacation rentals and Airbnb units. It is different from all the others on this page because it is an add-on device for your existing deadbolt, not a replacement device. Because of this the installation process of Augusta Smart Lock Pro is relatively fast but not quite as simple as just replacing a deadbolt. You may want to consider hiring a local locksmith to do the installation. Another thing that makes this lock unique for Airbnb is that it is already integrated into the Airbnb rental flow for a fully automated solution. Airbnb will create custom codes that activate and expire based on the Airbnb booking dates. If you have an Airbnb rental, this lock should be top of your list. Your renters can access via the August Smart lock app or an additional August Pin Pad can be installed so they can enter by PIN code. It is a very reliable lock that works with Alexa voice control. With this, you can always lock and unlock the door by voice commands. It also works with Google Assistant and Siri for easy operation. Apart from this, the lock is widely compatible with Smartphone for remote control and monitoring of the door. You can, therefore, lock and unlock the door remotely. To take advantage of all of the August Smart Lock Pro Vacation Rental features you will need to purchase the August Connect Hub. This allows you to gain access to a series of features form the August Smart Lock App (monitoring, issuing codes, locking, unlocking, etc…). The lock also features DoorSense, which tells you whether the door is securely locked or not, and it can be set to auto-lock your rental unit’s / Airbnb door. This lock does not have an eternal keypad or touchscreen by default, that is an optional purchase. It relies on digital keys using the app by default. By using bluetooth technology, the lock connects with a phone devices to auto-open the door when the smartphone is near. It integrates with the Z-wave Plus and Apple Homekit. This allows you to receive notifications whenever you go. This is the only Grade 1 (highest security) grade lock on this list. If you want the best physically built lock for you vacation rental or Airbnb rental, this is the one to go with. The deadbolt has a few extra features not found in other electronic locks including built-in alarm technology. This sets off an audible alarm and sends a notification whenever someone tampers with the door. It features an illuminated fingerprint-resistant touchscreen to make it hard to detect the pin code. 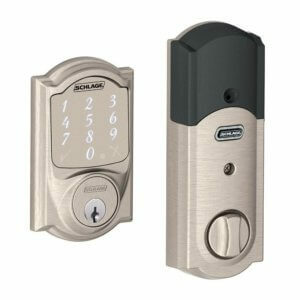 The Schlage Connect lock can accommodate up to 30 pin codes. It has a programming feature that aids in programming the user codes. This can be done through the Z-Wave platform provides or directly from the lock. 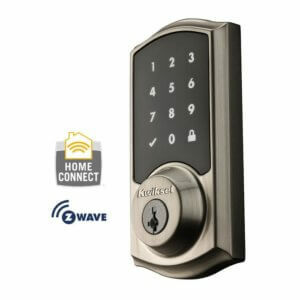 The Schlage Connect vacation rental lock uses Z-Wave or Zigbee technology for easy connection with the home automation system. With this, you can easily lock and unlock the door remotely through your phone device or the internet. It can integrate with Alexa, Wink, Samsung Smart Home, Google Assistant and Ring but a hub is required. Be sure to buy the Zigbee or Z-wave version you need to support the technology you are interested in. The smart lock is designed in a wide range of lock finishes to match the existing door hardware on your rental homes, Airbnb, and vacation rentals. These are the best locks for vacation rentals and Airbnb that will serve your needs for a long time to come. They are highly durable locks that have been designed with quality materials. The locks are also ergonomic and can be controlled remotely. They are compatible with a number of phone devices; hence you can lock and unlock the door from anywhere through the web or phone in most cases. Smart locks also integrate with a number of smart home devices. For example, they can use Alexa voice control for easy voice command and integrate with Alarm Systems.